One might say that Dieter was both unlucky and lucky at the same time. He was unlucky to be stricken suddenly with trigeminal neuralgia, one of the most excruciatingly painful conditions known to humanity. But he was lucky because his primary care physician recognized the condition and referred Dieter immediately to the Mayfield Clinic. Within weeks of the onset of his pain, Mayfield's trigeminal neuralgia experts treated Dieter at the Gamma Knife® Radiosurgery Center at The Jewish Hospital – Mercy Health. He walked out of the hospital pain-free. In contrast, many individuals with the condition suffer agonizing pain for years before getting an accurate diagnosis and relief. Dieter was going about life as usual four years ago when the crisis struck. He was taking a shower after working out, and as he began shampooing his hair, he felt a sharp pain flash like a lightning bolt from the top of his head to his jaw. "I thought, what in world's going on here?" Dieter recalls. "I thought if I scrubbed well, I'd get the pain out of it. But it got worse." Dieter tried to cope. He continued working, but he avoided touching his face. "I had to be careful when I ate; I had to chew slowly," he recalls. "If I chewed normally, I started crying. One night I came home from work and I cried I had so much pain. I couldn't eat. It was the worst pain I ever had." His two knee replacements, by comparison, "were a breeze to me." Two weeks after the pain struck, unable to stand it any longer, Dieter went to see his primary care doctor. The physician prescribed two medications, Tegretol and Lyrica. When the medications proved ineffective, producing cognitive side effects and no relief from pain, the physician referred Dieter to Mayfield. A Mayfield specialist officially diagnosed Dieter's condition as trigeminal neuralgia and offered various treatment options. a percutaneous stereotactic radiofrequency rhizotomy, or PSR: the destruction of selected trigeminal nerve fibers with a heating current. It was the third option that appealed most to Dieter and his wife and daughter. This involved Gamma Knife® stereotactic radiosurgery, the delivery of a high dose of precisely focused radiation beams to the trigeminal nerve during a single treatment session. "I had about two weeks to think about what I wanted to do," Dieter recalls. "We all agreed to go with the less invasive Gamma Knife.® If it didn't help, we thought we could try one of the other treatments later on." His decision made, Dieter was introduced to Ronald Warnick, MD, a Mayfield neurosurgeon with sub-specialty skills in radiosurgery. Dr. Warnick explained that the relief provided by Gamma Knife® could be temporary, giving Dieter two to three good years before the pain returned and a second radiosurgery procedure or other treatment might be required. "I told Dr. Warnick, I'll take the two to three years," Dieter says. Two days later, in January 2014, Dieter walked into the Gamma Knife® Radiosurgery Center at The Jewish Hospital. Dr. Warnick first immobilized Dieter's head in a rigid head frame, which he attached surgically with four small pins after numbing the area. A coordinate box was attached to the frame, and Dieter then underwent a series of brain scans, with the headframe holding him still and the coordinate box providing reference points on the images that would be used for accurate targeting during his treatment planning and delivery. After the scans were completed, Dieter rested quietly while his team planned his treatment. Later that morning, awake but lightly sedated, Dieter underwent radiosurgery. With the headframe holding his head perfectly still, the Gamma Knife delivered 192 beams of radiation to the root of the trigeminal nerve. When Dieter left the Gamma Knife® Center that day, his face felt normal. At his follow-up appointment two weeks later, he confirmed the excellent results. "They asked me if I had any pain and I said no, no pain at all. I told them, 'It's just miracle. I have no complaints whatsoever. I haven't had a pain since Day 1.'" Four years after his procedure, Dieter is still pain-free without any medications, his trigeminal neuralgia a distant, though not forgotten, memory. Hope Story Disclaimer -"Dieter's Story" is about one patient's health-care experience. Please bear in mind that because every patient is unique, individual patients may respond to treatment in different ways. Results are influenced by many factors and may vary from patient to patient. 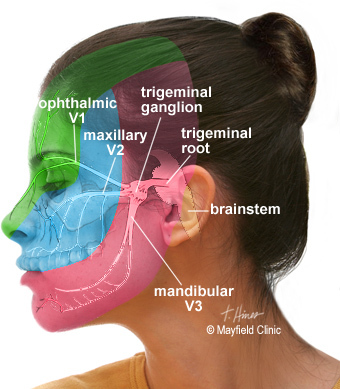 The trigeminal nerve supplies feeling and movement to the face. Learn more about trigeminal neuralgia.